Another good option for deodorant is a brand called herbal magic that my sis in law found a few years ago for us. I like this deodorant because it is liquid roll on and I wear it when I have on dark clothes. 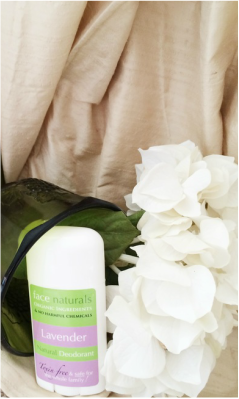 I don't feel that it completely takes the smell away as the facenaturals deodorant does but it does help with the perspiring. It is still a great option as it contains: witch hazel, algae extract, aloe Vera, baking soda, and herbal extracts. It does add a jasmine fragrance not an essential oil so if you are avoiding fragrance (as many fragrances have hidden toxins) then this may not be for you. I use this one more sparingly just because of the added fragrance. Water, algae extract, aloe barbadensis leaf extract, hamamelis virginiana (witch hazel) water (and) alcohol, sodium bicarbonate, alcohol (and) foeniculum vulgare (fennel) fruit extract (and) humulus lupulus (hops) extract (and) melissa officinalis leaf extract (and) viscum album (mistletoe) leaf extract (and) chamomilla recutita (matricaria) flower extract (and) achillea millefolium extract, citrus grandis (grapefruit) seed extract, phenoxyethanol (and) ethylhexylglycerin (cosmetic preservatives).